2016 Ford Focus ST – Have you heard? 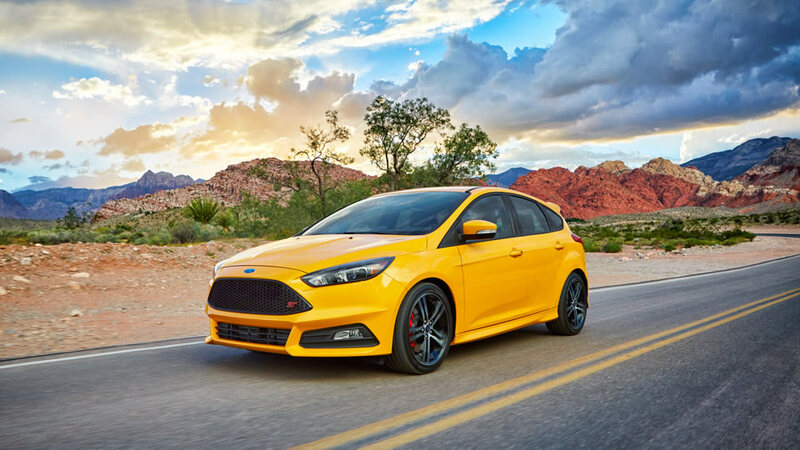 The 2016 Ford Focus ST combines European-inspired driving dynamics with eye-catching style! It also gives drivers other refinements convenient for everyday driving. Compared to vehicle challengers from Volkswagen and Subaru, the Ford Focus offers so much more! Unique handling features, awesome technologies and a high level of performance are all combined for an electrifying driving experience! Of course, we all know the old saying that beauty is in the eye of the beholder, but what does it really mean? It means that once you take a look at the 2016 Ford Focus ST, you’ll want one for yourself! The Focus ST provides the driver a distinctive performance unlike any other vehicle. It offers fun-to-drive qualities that truly set it apart from the other Focus models. The bold 18-aluminum wheels are standard on the Focus ST. That size wheel is only an option on certain other Subaru WRX models. The Focus ST driver-centric cockpit envelops the occupants. The Unique ST gauges keep the driver informed. The racing-inspired high-tech interior promise an exhilarating drive! The Focus St has the perfect combination of track-inspired features and the practicality for everyday use. Its RECARO seats are recognized for high-performance. Other cars, like the VW Golf GTI and the Subaru WRX have seats that are only styled in the same manner but really aren’t the real thing. The three-mode AdvanceTrac electronic stability control gives the driver of the Focus ST the ability to personalize the vehicle’s handling characteristics. This type of system is NOT available on the Golf GTI. The Focus ST also gives drivers more control of the electronic power-assisted steering with torque steer compensation. This feature is NOT available on the Subaru WRX. We know that a high-performance vehicle should deliver high-performance technology. The 2016 Ford Focus ST comes standard with a rear-view camera. This feature is only an option on the upper trim levels of the Golf GTI and the Subaru WRX. It also comes standard with Intelligent Access with push-button start. Buyers of the Golf GTI and Subaru WRX will only see it as an option on their higher series models. The available SYNC3 lets drivers use voice commands to control their paired phone, the car’s audio and so many more infotainment features. The other vehicles just don’t compare! So, are you ready for your VIP Test Drive experience yet? Our friendly and intelligent sales consultants are ready and waiting to help you pick out your favorite color! Give Beach Automotive a call right now to get the ball, or rather your new Ford Focus ST, rolling! 0 comment(s) so far on 2016 Ford Focus ST – Have you heard?